As the Rugby World Cup Sevens 2009 gears up for kick-off in Dubai, Scrum.com profiles the seven best players that the sport has had to offer. 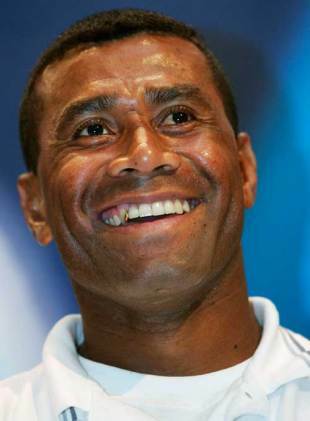 Waisale Serevi is widely acknowledged to be the finest Sevens player of all time. He also represented Fiji in the 15-a-side game and enjoyed a varied club career, including a stint at Leicester, but it is in the Sevens arena that his genius was plain for all to see. Serevi made his Sevens debut at Hong Kong in 1989 and played at the inaugural Rugby World Cup Sevens in 1993. While his Fiji side were unable to claim the Melrose Cup on this occasion, in 1997 and 2005 Serevi was on hand to help them to the title. Fiji are currently the only side to win the tournament twice, and under Serevi's coaching guidance they won their first IRB Sevens World Series in 2006. This was the first time the tournament had not been won by New Zealand, and was fitting testament to Serevi's influence. England's Ben Gollings is the leading scorer in the history of the IRB Sevens World Series, overtaking Fiji legend Waisale Serevi in 2005. His total currently stands at 1889 points, while he is also third on the all-time try scoring list. His conversion gave England their first win at the Wellington Sevens in 2009 and in the tournament at San Diego he celebrated his 50th IRB Sevens tournament. He competed at the 2005 Rugby World Cup Sevens and has also played at two Commonwealth Games. Gollings played club rugby at fly-half for Harlequins, Newcastle and Worcester before moving to Australia. During his time down under he has played for Tasman in New Zealand's National Provincial Championship and also Toyota Shokki in Japan, currently playing for Gold Coast Breakers. Born in Jedburgh, Ned Haig moved to Melrose while a child and began playing for Melrose RFC in 1880. In 1883 with the club's bank balance a little low he suggested staging a tournament as part of a sports day to raise money for the club. As the logistics of playing several full 15-a-side games in a single afternoon were prohibitive, Haig suggested that the game be shortened to 15 minutes and teams reduced to seven-a-side. The first Melrose Sevens saw Melrose defeat Gala in the final, and the town would go on to lend its name to the Rugby World Cup Sevens trophy, the Melrose Cup. In 2008 Haig and Melrose were inducted into the IRB Hall of Fame. Argentina's Santiago Gomez Cora is the leading try-scorer in the history of the IRB World Sevens Series. Gomez Cora has crossed for 213 tries in the colours of Argentina, a remarkable 40 more than his closest rival, South Africa's Fabian Juries. In January 2009 Argentina won their second IRB Sevens World Series event in San Diego, with their talismanic skipper Gomez Cora crossing for a try in the final as the gutsy Pumas held out to defeat England. Eric Rush enjoyed a long and successful career at the top of the Sevens game, winning his first cap in 1988 and continuing until after his 39th birthday in 2004. He competed for New Zealand in over 60 tournaments, winning two Commonwealth Games gold medals and the 2001 Rugby World Cup Sevens. During the tournament Rush broke his leg, leaving Jonah Lomu to claim glory in winning the final for New Zealand. Rush became a full-time Sevens player in 1999 with the introduction of the IRB Sevens World Series, calling time on his career in the 15-a-side game. Rush won 9 Test caps for the All Blacks between 1992 and 1997 while playing his club rugby for North Harbour. He retired from playing in 2005 and took up a coaching role within the New Zealand Sevens setup. One of the most famous and celebrated players of all time, Jonah Lomu complemented his feats in the 15-a-side game with a star turn as New Zealand won the Rugby World Cup Sevens in 2001. Following an injury to the talismanic Eric Rush Lomu stepped in and scored three tries in the final as New Zealand defeated Australia in Mar del Plata, Argentina. Lomu had previously tasted success with the Sevens side at the 1998 Commonwealth Games in Kuala Lumpur, where he helped them to a gold medal. Fijian flyer Vunibaka was the top scorer as Fiji powered to their first Rugby World Cup Sevens title in 1997 and still holds the record for number of tries scored at the tournament after also competing in Fiji's second victory at the tournament in Hong Kong in 2005. His 23 tries put him four ahead of countryman and Sevens legend Waisale Serevi. Vunibaka also appeared for the full Fiji side at the 1999 and 2003 Rugby World Cups and was a prolific try-scorer in the Super 12 for the Crusaders, notching 35 tries in 50 appearances.